Thank you for your continued support of Cowboy Motorsports here at Oklahoma State University. 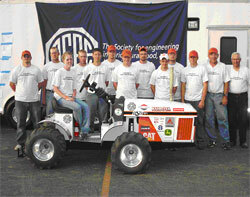 We are a group of student engineers who participate in a ¼ scale tractor pull and tractor design competition every year. We have used AMSOIL in our pulling tractors for the past four years. We believe your products are a vital tool for competing at the highest level.